#362 End of an era? #360 Is it a 'sin' to know God? #359 Can we truly know God? 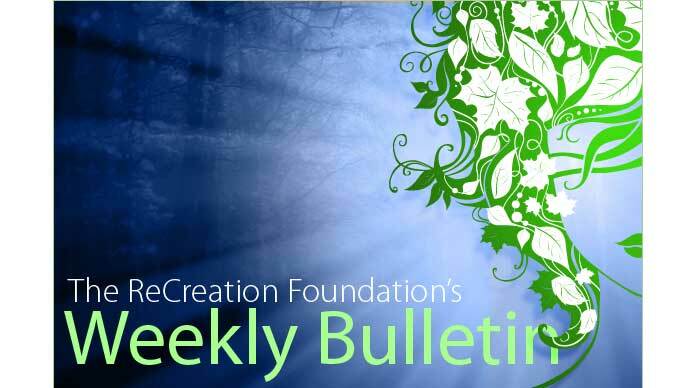 NOTE: The Weekly Bulletin is sent free of charge to anyone who asks for it. It is a publication of the ReCreation Foundation, a non-profit organization undertaking the work of sharing the message of Conversations with God with the world. That message is that the purpose of life is to recreate ourselves anew in the next grandest version of the greatest vision ever we held about Who We Are. I propose that the world be presented with a new knowledge of God...A New Theology. This proposal itself raises many questions. Can we ever truly know God? Is such knowledge possible? And from where would such knowledge arise? And how would the world prevent one person's knowledge from becoming another person's dogma? Can we ever truly know God? Yes. The ancient wisdom, "Mysterious are the ways of the Lord" happens, in fact, to be erroneous. There is nothing mysterious about God. God can be known, and God wants to be known. Indeed, it is God's desire to be known that is the driving force of the Universe, and the primal energy of all of Life. It is this desire that gives Life purpose, reason, and function. Life was created in physical form precisely so that God could know Itself. For it is physicality that creates the possibility of Divinity experiencing Itself. In the Realm of the Physical, such experience is possible --- but only in that realm. In the Realm of the Absolute, God is absolutely what God is: Pure Love, All Power and Glory Forever and Ever. Yet because there is nothing else but this, God cannot know what it is like to be this. For in the absence of what God is not, what God is, is not experienceable. God can know Itself, but God cannot experience what it knows of Itself...even as you can "know yourself" as, say, six feet tall, but you cannot experience what it is like to be six feet tall unless something exists that is not six feet tall. Thus, if you had the ability to do so, you would do everything in your power to create something --- anything --- that is not six feet tall. Then, it its presence, you could experience "six-foot-tallness." This is called "creating a Contextual Field," and it is for exactly this reason that God created the Realm of the Physical --- which might also be called the Realm of the Relative, as opposed to the Realm of the Absolute (or the Realm of the Spiritual), from which it emerges. We see, then, that from the Spirit emerges the physical. All things physical. Not just the physical world around you, but you also. From the Spirit have you emerged, and to the Spirit shall you return. You cannot go anywhere else, because there is nowhere else to go. Some people have referred to this process of returning to Spirit as "going to heaven." This would be an error in terminology. You cannot go to heaven because you are already in heaven. If we define heaven as the Kingdom of God, then you must know that you are already in heaven, and have been there from the beginning. You cannot get out of it if you wanted to, because there is nothing else but the Kingdom of God. No place else exists. God's kingdom contains three realms: The Realm of Knowing (which might also be called the Realm of the Spiritual, or the Realm of the Absolute), the Realm of Experiencing (which might also be called the Realm of the Physical, or the Realm of the Relative), and the Realm of Being --- which has no other name, for there is no other word in human language to explain or describe Pure Being. This three-part kingdom --- the three ways in which God expresses Itself --- is sometimes called the Holy Trinity. It is the 3-iin-1 aspect of Divinity which has been attempted to be explained in the theology of the Roman Catholic Church, and in most Christian churches which derived from it following the Reformation. The New Theology teaches us that this 3-in-1 description of God is accurate, and that Life as we know it is God made physical. Thus God has said to humanity, "I am with you always, even unto the end of time." The New Theology might write that sentence in this way: "I am with you all ways." Indeed, there is no way that Life expresses Itself that is not Divine. And knowledge of this Divinity in All Things --- that is, knowledge of God --- is possible. That will be our question for next week! Neale Donald Walsch through the years has given hundreds of talks and written scores of articles revolving around the messages he received in his Conversations with God. Now, every seven days, we will present in this space a transcript or reprint of those presentations. We invite you to Copy and Save each one of them, creating a personal a collection of contemporary and uplifting spiritual thought which you may reference at any time. We hope you will find this a constant source of insight and inspiration. This week's offering: Letting go of attachments. I often then go on to say, "It is not easy to stay away from attachments." And it isn't... unless it is. I want to tell you that I am very attached to my body, and that it is not easy for me to understand that I am something other than that. This idea that I exist -- the "I" of "me" that "I am" -- quite apart and separate from the body is a notion that feels completely foreign to my experience...except when it does not. I have had moments in my life when it has been remarkably clear to me that my body is nothing more than a tool that I use in the creation of my in-the-moment experience. Yet these moments have been the exception rather than the rule. In most of the moments of my life I have walked around thinking that the body I have is the "I" that is Me. What causes me to see what is true and to emerge from the maze is the elevation of my observation. I literally rise above the landscape of my present moment, looking down on it from a far and distant place, seeing myself in it but not of it. To be "in the world but not of it" is the goal of every spiritual seeker. It is the place where every spiritual mastery resides. So I've got to make a list of all the things that I'm attached to -- and that is going to be a very long list, indeed. And I've got to decide what it is that I want to detach from first. To be honest, I think I've already decided. I think I want to detach, first, from all of my dramas, all of my "stories," all of my false thoughts about life and how it is, and, most of all, from all of my need to stay hidden -- and to use fibs and lies as a means of doing so. Shakespeare said, and he was right: "To thine own self be true and it shall follow as the night, the day, thou canst then not be false to any man." For those of you who would like to attend a retreat in Great Britain, I highly recommend the following by Sarah Rozenthuler, who is a magnificent teacher of this material. She is a graduate of the Foundation's Life Education Program and has worked with Neale (see his quote at the end). Do not miss this opportunity. We can all have a friendship with God. In fact we all do, it's just that some of us don't know it. Developing a real, fully functioning relationship with God is one of the most exciting, rewarding and moving things we can do. There are a thousand ways to grow a friendship with God. The fruits of cultivating this friendship remain the same whichever way we go about this. We feel companioned so that loneliness disappears, we feel guided as we are able to call forth answers to our questions, and we feel supported with an ever present resource in time of need. This weekend workshop is an opportunity to explore the question: what does having a friendship with God mean to you? How can you deepen your connection with the Divine? Coming together with other like-hearted souls creates a field of energy where insights and remembrances can emerge more abundantly. Moving into stillness can be a challenge for many of us with busy lives. We will practice some different approaches to going into silence including sitting, walking and moving meditation. Experiencing these for yourself and knowing where you can go for additional resources makes it more likely that you can integrate them into your daily life. Igniting your awareness of the Divine each day can transform your whole experience of life in all its ups and downs, trials and triumphs. To know God you have to be out of your mind. One of the most effective ways to get out of our minds is to get into our bodies. 5 Rhythms® is a moving meditation practice designed to do just that. There will be an optional 1.5 hour session led by Clare Backwell, an accredited 5 Rhythms® teacher. Clare has been teaching for 5 years and has a clear and down-to-earth approach making this practice easily accessible to everyone regardless of age, ability or experience. Please bring loose comfortable clothes and soft shoes. You don't need any previous experience of meditation or any other practice in order to fully participate in this weekend workshop. You may find it helpful to read in advance Friendship with God by Neale Donald Walsch and to bring your copy with you as the workshop will draw on material from this and other sources of spiritual wisdom. Helping me to hold the space will be Helen Dunne, Tricia Wilson and Ralf Klein, all of whom have been co-facilitators at the 1-day A New You workshop. The venue is Charney Manor, a Quaker retreat centre in rural Oxfordshire set in three acres of garden (www.charneymanor.org.uk) Oxford and Didcot Parkway train stations are both about 12 miles away. You can arrange a taxi from Didcot Parkway station to collect you at a fixed cost of £24 per car by calling B.H. Cars on 01235 200 635. Accommodation is in twin and single rooms of which all but two are en-suite. Two bedrooms are adapted for wheelchair use. If there is someone you want to share a bedroom with, please let us know. We will allocate participants to shared rooms once the single rooms have been taken (men with men and women with women). The weekend workshop is fully catered for and arrangements for special dietary needs can be made. The workshop begins at 5pm on Friday 30th October. Please arrive at 4pm to check-in, find your bedroom and get settled in. The workshop will end with fond farewells after lunch on Sunday 1st November. The following costs are inclusive of accommodation, all meals and refreshments and all materials: £288 for payment before 1st August 2009 and £320 thereafter. There are a small number of bursaries available - please enquire. Please email Sarah Rozenthuler at info@anewyouworkshop.com for a booking form. Booking needs to be accompanied by a deposit of £100. Please make cheques payable to Sarah Rozenthuler. I can give you account details if you want to pay direct. The balance is due on or before 1st October 2009. Places at the workshop are limited to 28. You are advised to book early to avoid disappointment. If you have any questions about the workshop please email or phone me. I will do my best to respond as soon as I am able. "Of all the people in the world who are sharing the messages of Conversations with God with others, no one knows the material better or imparts it with more wisdom, insight, or gentle grace than my dear friend Sarah Rozenthuler. Her precious work with people, both individually and in groups, offers a wonderful opportunity for help and healing during times of change and challenge. I know of no one more effective in assisting others in quickly expanding awareness and effectiveness beyond previously imagined limits." A look at events at which Neale Donald Walsch will share the message of Conversations with God in the weeks ahead. You can learn more about the work of the ReCreation Foundation at these events...and on its official website, www.cwg.org, as well. NOTE: Not all events are sponsored by the ReCreation Foundation, but because all of the events move forward the message of Conversations with God, which is the mission of the Foundation, the Foundation is pleased to inform you of them. 10/14/09 When Everything Changes, Change Everything. 2/20-26/10 What's In the Way Is the Way! Geek Squared, LEP Graduates and other friends. If you enjoy this FREE bulletin, and feel that you get great value from it, please consider making a donation to help us continue to offer services like this. The CwG Foundation is a non-profit organization and any donation amount is greatly appreciated. Please note that we do our best to see that all letters get a response, if not directly from Neale, then from a CwG Foundation staff person, or LEP participant.